First Nations students get 30 per cent less funding than other children, says former chief economist with TD Bank. Don Drummond counters Indigenous Affairs' claim that funding gap cannot be measured. Read the article on CBC News. In this episode of Mansbridge One on One, Peter Mansbridge sits down with Cindy Blackstock to discuss her work advocating for the equal treatment and funding for Aboriginal and First Nations children (CBC). In a landmark ruling, the Canadian Human Rights Tribunal finds the Canadian government is racially discriminating against 163,000 First Nations children. Read the ruling, information sheets that describe the case and its implications, and the press release here. On Tuesday, January 26, 2016, the Canadian Human Rights Tribunal will release its ruling on the First Nations child welfare discrimination case. The Caring Society and the Assembly of First Nations will hold a press conference at 1 pm. Watch it live: livestream.com/afn/iamawitness. A ruling on the First Nations child welfare human rights case is expected between December 21, 2015 to January 29, 2016. 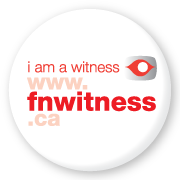 For updates, keep an eye on fnwitness.ca and follow @Caringsociety on Twitter. Tribunal decision update on the occasion of the tragic passing of Tribunal member Bélanger. In memory of Tribunal Member Bélanger. We are forever grateful to you for your service. Shannen Koostachin remains an important role model for Aboriginal and non-Aboriginal children and young people who continue to carry her dream for safe and comfy schools for all First Nations children in Canada. On November 27, 2015, Charlie Angus talked about his new book about Shannen and indigenous education on CBC's The Current. Listen here. Caring Society executive director Cindy Blackstock calls on newly elected Prime Minister Justin Trudeau to put an end to inequalities for First Nations children, in a letter dated October 20, 2015. For more about the First Nations child welfare human rights case, and Cindy's hopes for the new government, read this story on APTN National News. A new report by the B.C. Government and Service Employees' Union shows that care for Aboriginal children is under-resourced and culturally inappropriate. Read the Caring Society's guest post on the Canadian Paediatric Society blog. 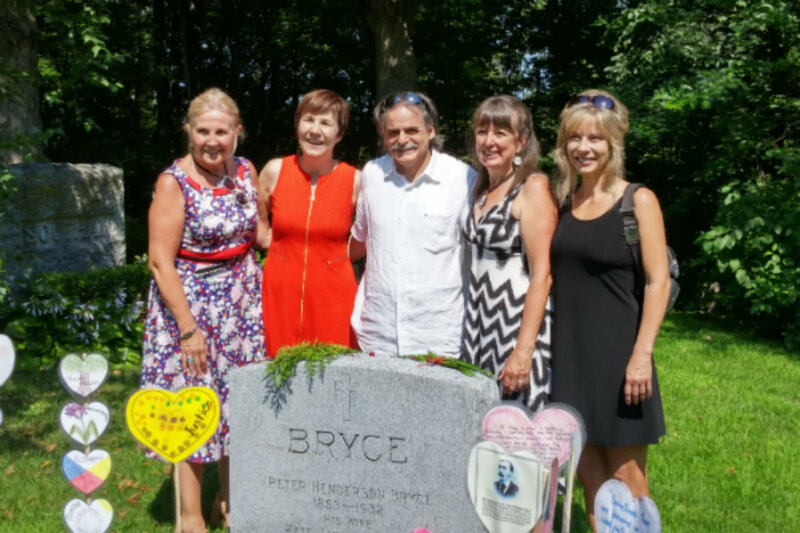 On August 16, the Caring Society, Truth and Reconciliation Commissioner Marie Wilson, members of the Bryce family and other friends and supporters gathered at Beechwood Cemetery in Ottawa to celebrate the legacy of Dr. Peter H. Bryce. The Ottawa Citizen previewed the event in this article. And in this video, APTN National News speaks with Dr. Peter Bryce's grandson, Andy Bryce and Caring Society Executive Director Dr. Cindy Blackstock. 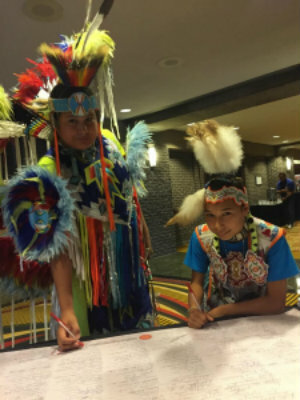 On June 10, 2015, chiefs from across Quebec and Labrador signed a Declaration on the Rights of First Nations Children. The declaration proclaims First Nations children's rights to grow up safely, be healthy, get a good education, learn their languages and be proud of their cultures. 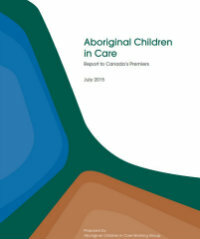 The Aboriginal Children in Care Working Group, made up of departmental ministers across the provinces and territories, releases its report to Canada's premiers. Nominations for health professionals who courageously advocate for the safety, health or well- being of Inuit, Métis and First Nations children and youth are now being accepted until October 16, 2015. Click here to learn more about Peter Henderson Bryce, the Award, and past winners. Click here to access information sheets on the Canadian Human Rights Tribunal on First Nations child welfare by the Canadian Child Welfare Research Portal. Click here to read the article from Muskoka Metroland Media. The Canadian Human Rights Tribunal (CHRT) found that the federal government did retaliate against Cindy Blackstock and awards $20, 000 in damages. Dr. Blackstock will donate any funds to children's charities. Click here to read the decision. Watch the new 5 second Caring Society commercial done by Horizon Travel & Lifestyle: https://www.youtube.com/watch?v=rMcxzuLQuSk. It will be playing May/June 2015 in the Toronto subway tunnels.